TASCAM's DR-60DmkII, an update of the award winning DR-60D, is the audio recording solution for on-set filmmakers and videographers. The streamlined design fits perfectly under a DSLR camera rig, without relying on bulky recorders or the limited audio quality of the camera’s microphone in. ProSound Network Best of Show The streamlined design fits perfectly under a DSLR camera rig, without relying on bulky recorders or the limited audio quality of the camera’s microphone in. Reach beyond the limited performance of your camera’s audio to capture the other half of your film. 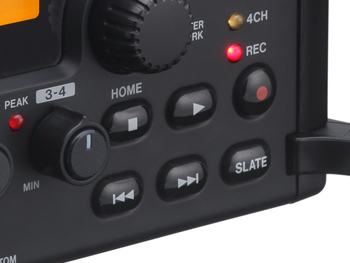 At a cost less than competing preamps, the TASCAM DR-60DmkII is the ultimate 4-track recorder designed for filmmakers, television, live events and web broadcast. High quality mic preamps are a necessity for high-grade sound. The DR-60D's HDDA mic preamplifiers (High Definition Discrete Architecture) employ discrete circuitry and premium parts, approved after months of evaluation testing. The HDDA s circuit achieves an incredibly high EIN (-120dBu) for the lowest noise level available. The DR-60DmkII mic preamps have been upgraded for up to 64dB of gain with new XLR input jacks for greater cable compatibility. A CIRRUS LOGIC's AD converter (used also on the DR-40 portable recorder) is used to ensure detailed recording from any input signal. Three sets of stereo outputs are provided. A Camera Out sends a reference track recording to the camera. 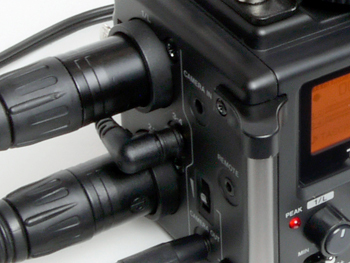 The Line Out can feed a mixer or recorder. Finally, a powerful Headphone Out is available for direct monitoring. Each of these outputs has its own level control, and the Camera Out can be attenuated to microphone level without the need for an attenuating cable. The DR-60DmkII has an internal digital mixer for all 4 tracks. Adjust pan and level, add a Limiter or Hipass Filter (40/80/120Hz), and set individual channel Delay from the user-friendly set-up. The DR-60DmkII is ready to use right out of the box with its external, non-menu-intensive controls. 4CH mode: This mode records all four microphone inputs to their own tracks. DUAL MONO and DUAL STEREO mode: Records a back-up safety track in case levels are set too high and clipping occurs. The safety track can be set to record from -6dB to -12dB below the initial take. If an actor suddenly screams a line, you have a backup recording that isn’t distorted. 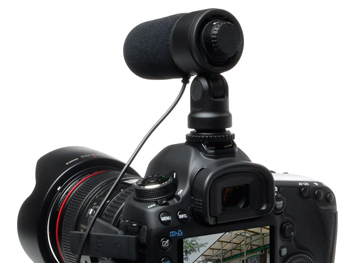 Every aspect of the DR-60DmkII is designed specifically for DSLR Audio for Video Recording. The keys of the unit are designed specifically for quiet operation to eliminate handling noise. The Slate feature is designed to mark tracks easily while in production. 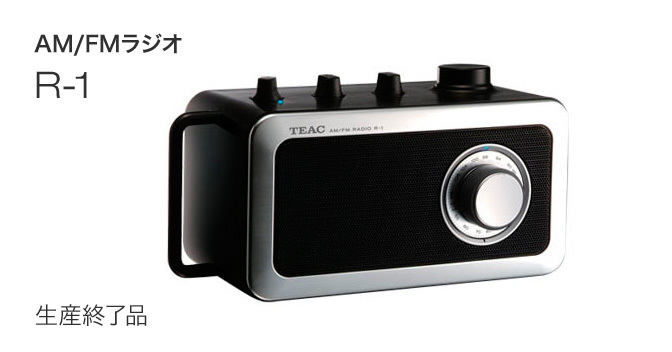 The input and output layout is designed for versatile use. Whether the device is used under a camera, on a rig or strapped around a solitary sound engineer, TASCAM's DR-60D will meet all on-site audio production needs. The CAMERA OUT connector sends the mix from the DR-60DmkII to your camera. An adjustable level control is provided, as many DSLR cameras lack an input control. The camera audio gets a clean mix from the DR-60DmkII to assist syncing tracks in editorial. Most modern editors – including Final Cut Pro X and Adobe Premiere – include a function to automatically synchronize audio recordings with camera clips. If your editing software lacks this feature, applications such as Red Giant PluralEyes can automate the process. 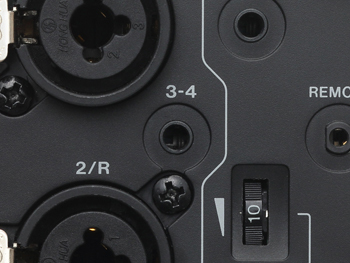 The channel 3/4 input connector supports a high-level maximum input – up to +10dBV. Many microphones designed for use with video cameras have a high-level output and a 3.5mm output connector. Plug-in power is also available for microphones that need it. The DR-60D can be placed between a DSLR Camera and a tripod, or mounted to a cage or follow-focus rig. A tripod socket is on the bottom of the unit, and a (removable) tripod bracket is mounted on the top. The DR-60DmkII's body was manufactured with very rigid plastic for a durable but lightweight design. 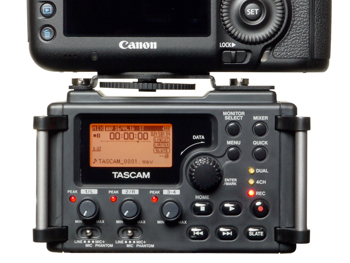 TASCAM understands how important weight is to steady camera movement when filmmaking. In addition to its light weight, the feature-rich DR-60DmkII is extremely compact. Only 5.25" wide, the DR-60DmkII won’t interfere with camera operation. All batteries can be replaced without removing the device from the Camera or tripod / rig.